Sub:. School Education - Rashtriya Ekta Diwas (National Unity Day) will be observed all over the Country on 31.10.2017 to Commemorate the birth anniversary of Sardar Vallabhbai Patel — Certain Instructions issued - Reg. The attention of all the Regional Joint Directors of School Education and Educational Officers in the State is invited to the reference read above (Copy enclosed) wherein Government while enclosing a copy of the Government Memo No. 265/SC.I/A3/2017 - 1, dated: 06.10.2017 of the GA(SC) Department and requested to arrange to ensure that the ‘Rashtriya Ekta Diwas Pledge’ is observed all over country to commemorate the birth anniversary of Sardar Vallabhai Patel at 11.00 AM on 31.10.2017 and also requested to take necessary action for organizing ‘Run for Unity’. 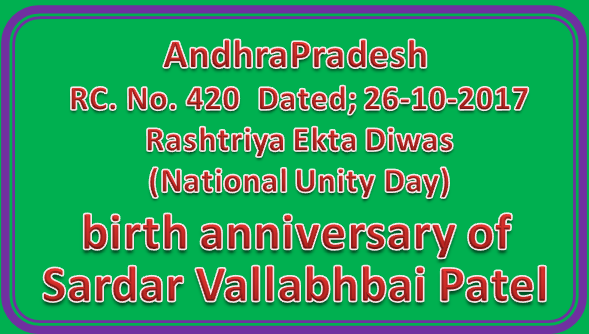 Further, the Government (General Administration (SC) Department) have informed that with a view to foster and reinforce our dedication to preserve and strengthen unity, Integrity and security of our nation, Rashtriya Ekta Diwas (national Unity Day) will be observed all over the Country on 31st October, 2017 to Commemorate the birth anniversary of Sardar Vallababjai Patel. This occasion provide us an Opportunity to re-affirm the inherent strength and resilience of our nation to withstand the actual and potential threats to the unity, integrty and security of our country. Therefore, it is requested to give appropriate directions and guidance to all concerned so that the Rashtriva Ekta Diwas (National Unity Day) could be organised and celebrated in a befitting manner on 3lst October, 2017. A Pledge taking ceremony may be organised on 31st October, 2017. The bi-lingual text of the ‘Rashtriya Ekta Diwas Pledge’ (Both in Hindi and English is enclosed. A ‘Run for Unity’ may also be organised at the State/ District Headquarters, involving people from all the sections of the society, so that a message of national unity could permeates to every part of the nation and the society.